In this week’s blog post, we will be reviewing three unforgettable touristic locations in Fethiye. Each unique in their own ways, the first location we pick is Kayaköy (Ghost Town), a city that was devoured by historical events. 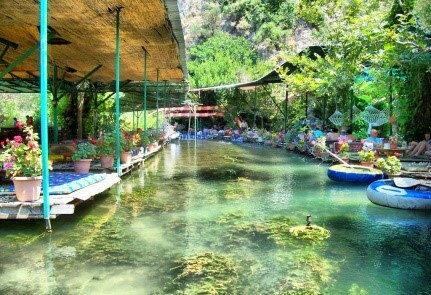 Our second stop is Saklıkent Gorge, which is a tourist attraction. Lastly, we picked Saint Nicholas Island, a tourist stop of natural beauty. Before we begin, we suggest you visit our tours page and discover the tours we arrange all around Fethiye! At the beginning of the 19th century, Kayakoy was in full flow. Schools, churches, shops and business operated in harmony. Life was good. The village was thriving as a community. The most important part of its history lie in the fact that within the village, Greeks and Turks lived side-by-side. The Greeks called the village Levissi while the Turks called it Kayakoy. The loss of the First World War, the collapse of the Ottoman Empire, and the attempted Greek occupation of the Anatolian region, all combined to force the decline of Kayakoy. Greek Christian citizens were forced to go to Fethiye harbour for deportation and Muslim Turks were expelled from Greece. Most of the returning Turks did not want to settle in Kayakoy. Of the ones that were already there, left after an earthquake hit. The point is though, a combination of historical events forced people to leave their friends, neighbours, homes and uproot their children. Whole lives changed forever when the signing of the treaty for the Turkish Greek Population exchange took place. With an effort to move on from the past, UNESCO named Kayaköy the world friendship and peace village. 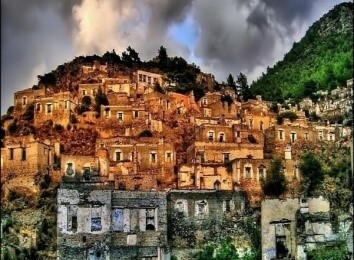 Now Kayakoy Ghost Town in Turkey is an open-air museum with 3.5 thousand preserved houses and three churches. The largest of them is the Basilica of Panayia Pyrgiotissa (has been built in 1888) is located on the right of the main street – it is really difficult to pass by this impressive building in the gothic style. It takes your breath away when you come inside and see nobody but the bare walls. Saklikent, meaning "hidden city" in Turkish, is around 50km from Fethiye in the Mugla province, and just a 20-30 minute drive from Kalkan. It is 18km long and 300m deep; one of the deepest canyons in the world. It was opened to the public as a national park in 1996 and it has since proven very popular with tourists. There is an entrance fee per person. You can visit all year round, though between November and March, the water can get very high, so you may not be allowed to walk through. From April onwards, when most of the snow from the Taurus Mountains melts and passes through the Gorge, around 4km of the gorge is usually walkable. When you walk over the bridge to the entrance, the first thing that strikes you is the huge, 10 meters crevice in the rock. Then the vast sculpted walls towering high above and the sound of water rushing through the ravines. There is just one obstacle before you can walk through the Gorge, and that is crossing the river. The fresh mountain water is notably cold and is often up to waist height over this 6-8 meters stretch of river, so be sure to wear clothes you don't mind getting wet. Sensible submersible shoes with grips are essential as the stones beneath the water can get quite slippery. Sea shoes are ideal but if you don't have any, jelly shoes can be hired at the entrance for a small fee, although may not be as comfortable as your own pair. The water is very shallow in parts but deeper in others (not normally above the knee), depending on what time of year you visit. The gorge walls create all sorts of shapes as you look ahead of you, and if you have a camera, you will find plenty of photo opportunities on the way through. After you have walked for around 40 minutes, you will come to a waterfall, and if you want to go on further, prepare to get wet again! When you have finished walking through the Gorge, you can take a leisurely wander around the little shops lining the riverside, selling novelty gifts, honey, jewelry etc. Across the other side is a cafe/restaurant and there are platforms above the water where you can relax with a Turkish tea, Efes or an ice cream and dip your feet in the cool water. St Nicholas Island, also known as “Gemiler Island”, is famous for being the supposed resting place of Saint Nicholas or otherwise known as “Santa Claus”. 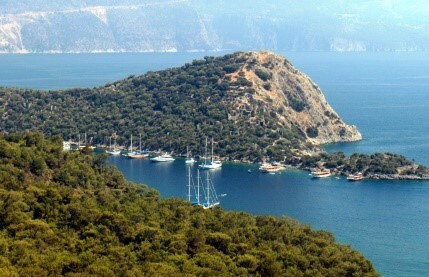 The island is located only 20kms away from the large town of Fethiye. It is believed that when St Nicholas died in 326 he was buried here on the island before moving remains to Demre due to increased pirate raids. The island is scattered in some impressive ruins well worth the exploration. There are five churches that date back to the 4th and 6th centuries AD along with a large covered walkway that is over 300 meters long. St Nicholas Island is also one of the best spots to sit atop and get to witness one of the most magical sunsets in Turkey. St Nicholas Island is not accessible by land; however, there are a few ways to gain entrance to the island. 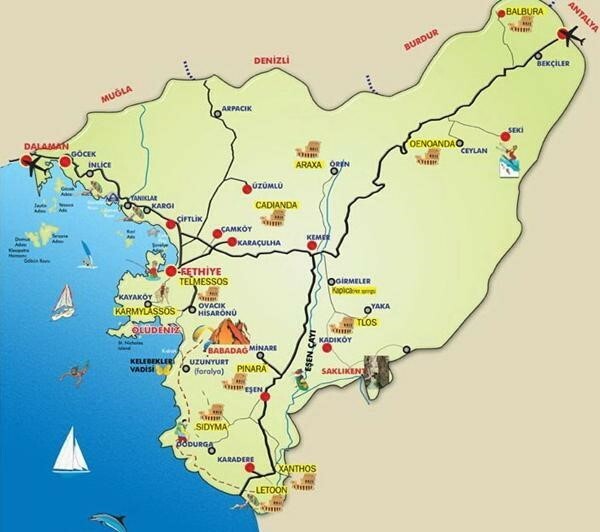 The first is to catch a bus from Fethiye to the Greek Ghost Town of Kayakoy. From here, there are both taxi’s and buses travelling down to Gemiller Beach. Once on Gemiller Beach, it is just a short boat ride to the island. You can ask the watersports companies or a local boat owner to transfer you to the island and return you to the beach and for exploring the area. If you are to visit Fethiye, we suggest you visit our website and discover our services such as, airport transfers, and rent-a-car. Don’t forget to check the tours we arrange for a fun, and relaxing holiday! As Fethiye Lovers crew, we wish everyone a fun, and relaxing Summer 2018!